The 2012 college football season has come to an end and the final polls are out. Georgia finished ranked 4th in the USA TODAY Sports Coaches Poll and 5th (tie) in the AP Poll. Georgia’s final record was 12-2 overall and 7-1 in the SEC. The Bulldogs lost a heart breaker to eventual national champion Alabama in the SEC Championship Game, but the Dawgs bounced back to defeat Nebraska 45-31 in the 2013 Capital One Bowl. The Bulldogs went into the 2012 season ranked 6th in both polls. In the Coaches Poll, the Dawgs fell to 12th after a loss at South Carolina, but climbed all the way up to 3rd heading into the SEC title game. 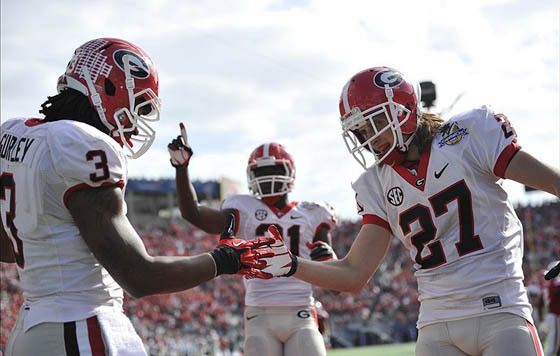 UGA was ranked as low as 14th and as high as 3rd in the AP Poll. Georgia will likely be a preseason Top 10 team again heading into the 2013 season. The Bulldogs return virtually their entire offense, including record-setting quarterback Aaron Murray and running backs Todd Gurley and Keith Marshall. The Dawgs will have to reload on the defensive side of the ball after losing several seniors and a few juniors to the NFL Draft, including linebackers Jarvis Jones and Alec Ogletree.